We’ve all experienced anxiety at some point in our lives, whether it be over an important test at school, going for a job interview, meeting our SO’s parents for the first time, breaking someone’s heart, or buying our first home, but for some of us, anxiety is a part of our daily routine. Anxious thoughts eat away at us morning, noon, and night, and while we’re able to develop coping strategies over time through therapy or our own trial and error, learning how to deal with anxiety in children is an entirely different ball game. As adults, we typically know when our fears are grounded or irrational, but children lack this kind of perception. All they feel are the physical symptoms that come along with anxiety – tummy aches, sleeplessness, and a desire to avoid anxiety-producing situations – and they don’t necessarily make the connection that a certain person, place, or thing is causing them to feel anxious. Add the fact that parents can unknowingly make a child’s anxiety worse when trying to protect her from feeling anxious, and we’ve got a recipe for disaster on our hands. The good news is that, if you’re the parent, caregiver, or teacher of an anxious child, there are certain things you can do (or stop doing!) to help lessen her feelings of anxiety. Here are 12 tips to help you get started. As tempting as it is to diminish your child’s anxiety by telling her to stop worrying – and as difficult as it is to keep your patience in check when your child repeatedly gets worked up over something seemingly inconsequential to you – it’s important to remember that your child’s fears are real and scary to her. Anxiety can also be very isolating, and when you acknowledge your child’s fears in a supportive way, you will help her feel less alone. When our children feel stressed and anxious about something, our natural instinct is to find ways for her to avoid it. Out of sight, out of mind, right? Unfortunately, this sort of negative reinforcement only works in the short-term. While we may be able to keep our child’s anxiety under control through avoidance in the here and now, most anxiety-provoking situations cannot be avoided forever, and it is our responsibility as parents to set our children up for long-term success and help them find coping strategies. It’s no secret that taking deep breathes can help restore a sense of calm when anxiety hits, and kids with anxiety can benefit greatly from deep breathing exercises as well. A great way to teach this concept is to have your child blow bubbles when she’s feeling anxious. You can keep a stash of mini bubbles in your purse and car to get started, and once she’s mastered the concept, have her practice blowing bubbles without the wand. This will give her an effective coping strategy she can use anywhere and anytime. While some children find it helpful to talk about anxiety-producing events ahead of time to ensure they are prepared, others become debilitated with what I like to call ‘anticipatory stress’. The best example I can think of is going to the doctor. My daughter used to HATE visiting her pediatrician, and once I realized my attempts to prepare her for each appointment did nothing but make her more anxious, I stopped giving her advance warning. She still gets upset, but rather than agonizing over it for hours beforehand, the worry only lasts from the time we park our car outside her doctor’s office until the appointment is over, which is much more manageable for everyone. Of course, you know your child better than anyone, and have to do what works best for her. If you’re the parent of a child with anxiety, it’s important to remember that she probably worries she’s different from her friends and classmates as a result of her anxiety, and that worry probably does nothing but make her anxiety worse. Remind her that everyone experiences anxiety in their lives, and give her (appropriate) examples of things that cause you worry and what coping strategies you use to make yourself feel better so that she feels less alone. Adults and kids with anxiety often suffer from what therapists refer to as ‘cognitive distortions’, which are irrational thoughts and beliefs. These happen automatically, and while we are all guilty of blowing things out of proportion or focusing on the negatives instead of the positives at some point in our lives, cognitive distortions are much more prevalent in adults and kids with anxiety. The trick is to learn how to identify these thoughts when they occur, and then find a more logical way of thinking. Your child fails her spelling test, and rather than committing to studying harder next time, she distorts her thinking by thinking things like: I’m stupid. I’m a disappointment. I’ll never learn how to spell. I’m going to fail grade 4. My teacher hates me. When a situation like this happens, ask your child to write down all the things she’s thinking and then help her challenge her distorted thoughts (‘failing one test will not define the rest of my life’), replace them with a more logical way of thinking (‘I failed because I didn’t study hard enough’), and find ways to ensure it doesn’t happen again (‘I will study harder next time’). By putting things in context and thinking through them logically, you will help encourage more appropriate responses in the future. Another great way to cope with anxiety in children is to ensure your little one has tools readily available when anxiety strikes. Fidget toys, squeeze balls, and chewing gum are all great classroom-appropriate ideas that can help reduce feelings of anxiety and restore a sense of calm. It’s no secret that children are motivated by rewards, and if your little one struggles with anxiety, a great strategy to encourage her to face her fears is to motivate her with rewards. A sticker chart, special outing with mom, or extra time on the iPad are all easy but effective ways to encourage a child with anxiety to face her fears instead of avoid them. Being the parent of an anxious child can be very draining, and finding the time to take care of and put yourself first every once in a while will not only enable you to be a more patient parent, but it will also help you model the importance of self-care to your child. Here are 20 of my favorite self-care activities to give you some inspiration! A great strategy I once read for treating anxiety in children is to designate a certain time for your kids to worry each day. This could be a 10-minute period before or after school where your little one can write down, draw, or talk about the things that are causing her anxiety, but the point is to keep it short and sweet. Allow her to get her feelings out, and then encourage her to put them away and forget about them for the rest of the day. When it comes to anxiety in children, one thing we often forget is the importance of simply being there for our kids. We get so caught up in trying to fix things that we fail to remember that all our child really needs from us is to feel loved, secure, and supported, even when their worries leave us feeling exasperated, confused, and defeated. Make sure to find time to do fun things together, make yourself available when anxiety strikes, and be positive and encouraging instead of negative and annoyed. Self-care isn’t just important for adults – it’s important for kids, too! Teaching your anxious child how to relax and take care of herself will help her find ways to cope with anxiety, and how to prevent anxiety from occurring as well. Check out some of our favorite relaxing activities for kids below! 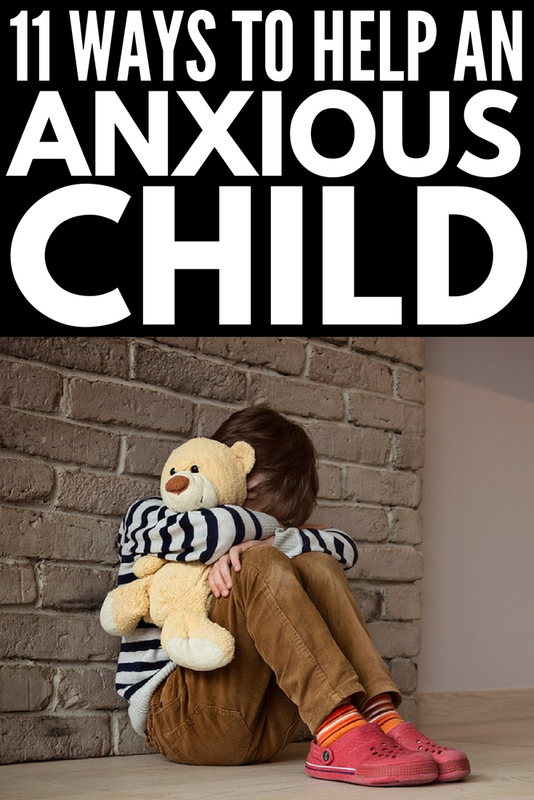 As emotional, frustrating, and difficult as it can be, anxiety in children is a real thing, and it can be extremely scary and overwhelming for a small child to experience. And while our job as parents is to find ways to help our little ones function in the world, there comes a time when we need to think outside the box and figure out different strategies to help them cope with things we may never understand. I recently stumbled upon a fabulous list of 49 Phrases to Calm an Anxious Child on GoZen, and it has been an invaluable tool in helping me understand what we should – and shouldn’t! – say to children with anxiety. I hope it helps you as much as it has helped me, and that the strategies for dealing with anxiety in children listed above inspire you to find ways to help your child cope with anxiety. If you found these tips for coping with anxiety in children helpful, please share this post on Pinterest!